Former KGB officer, Anatoly Golitsyn wrote in his 1984 book, "New Lies For Old" that the world was heading for a major showdown. Golytsin predicted (based on plans he was partially privy to through his KGB work) that Russia, China, the old communist bloc, the Islamic states and India would form an anti US alliance. They would work to isolate the US politically and economically until the balance of power swung in their favour. They would then either strike militarily or issue an ultimatum to the US-join us, or face destruction. Sounds very melodramatic doesn't it? A little hard to believe in this era of peace, prosperity and post-communism? 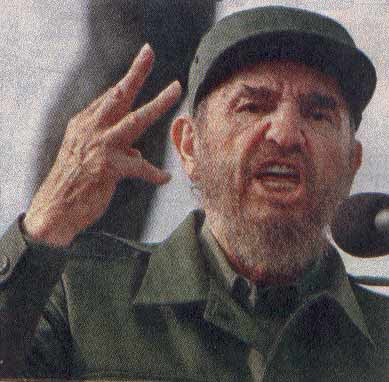 Below is a "hot off the press" article by Cuban leader Fidel Castro, reprinted in Political Affairs, the theoretical journal of the Communist Party USA. This article is worth reading in its entirety-here. Its implications are enormous. In the article Cuban leader Fidel Castro discusses the isolation and encirclement of the US by Russia, China, India and their communist and Islamist allies. Castro names the Shanghai Cooperation Organisation (Russia, China, ex-Soviet central Asia are members, Iran, India, Nepal and Pakistan are observers, and/or prospective members) as the core of this new anti-US alliance. He also adds to the mix, the neo-socialist regimes of Latin America. Does Castro vindicate Golitsyn? You judge. Something's Gotta Give: Will the World Unite Against the US? In the reflection published on July 31st, I explained what it meant for me to have spent a year gathering information and meditating in depth on the vital problems which today threaten our species as never before. Colonel General Leonid Ivashov, a defense expert, stated that the main instrument of the US policy is the economic, financial, technological and military dictate. By implementing this, the US is trying to secure the world’s hegemony for itself. Its national security strategy explicitly indicates the necessity of guaranteeing sustainable access, in other words, controlled access, to the key regions of the planet, strategic communications and global resources. It is a strategy that has been turned into a law, and this brings us to the conclusion that in the future the United States will face even tougher conflicts with Russia, China and India. Washington insists on building a system capable of neutralizing the nuclear potential of Moscow and Peking, its strategic rivals, in order to achieve military superiority. The United States wants to deploy its anti-missile shield not just in Europe but also in other parts of the world, to see what is going on in Russia and China. Likewise, it is seeking to increase its offensive arsenal at a pace that surpasses even that which was followed during the Cold War. The United States would do anything in its power to prevent Russia from being an autonomous player. The debates on anti-missile defence, Iran and Kosovo, have not generated any formulas for compromise. It is important for Russia to consolidate its positions and recover its geopolitical potential. Early on the 1970’s, when Moscow had achieved nuclear parity with Washington, the latter became aware of the fact that it could not beat Moscow militarily and accepted to negotiate on equal terms. Consequently, in 1972, the Anti-Ballistic Missile Treaty (ABMT) as well as all other subsequent Strategic Arms Limitations Treaties (SALT) were signed. Strength is the only thing that the United States cares about. If it feels to be in a stronger position, it will never make concessions to anyone. In order to neutralize the plans for world hegemony it is necessary to build an alternative pole, and we already have the foundations to do so: the Shanghai Cooperation Organization (SCO). In fact, it appears to be rather incorrect to speak about the United States strength. The United States has military power, a vigorous economy and an enormous amount of hard currency which it can mint in unlimited quantities, but the geopolitical level of the country is extremely low. The United States inspires very little political confidence in the rest of the world. In 1999, China and Russia stated before the UN General Assembly the need to preserve the Anti Missile Defense Treaty of 1972. All nations voted in favor of the proposal except for four: the United States, Israel, Albania and Micronesia. The result bears witness to the United States’ total international isolation. Without the participation of Russia, it would be impossible to resolve the situation that has taken shape in the Middle East, the Balkans, the Korean Peninsula and other regions of this planet. This also holds true for China, which is able to put up to the pressures exerted by the United States. China enjoys great prestige in the world; it has a powerful economy and a strong currency. The SCO ought to recruit new allies and combine the potential of those countries which want to and are capable of implementing an autonomous policy. First, it is necessary to officially proclaim the rejection against the United States world hegemony. Second, China and Russia must denounce the deployment of the US anti-missile defense system before the UN Security Council, as an action altering the architecture of global security and threatening the entire international community. China, India and Russia could form a united front in the face of the United States’ dictates. It is also possible to propose the stabilization of the global financial system as a task. Within the SCO framework, a novel philosophy could be formulated, based on the harmony among civilizations and on the rational use of natural resources. The majority of States will surely support such measures, of that I am convinced. Thus, a new political pole will come into being, the pole of peace. The SCO mission is to create a new model of development for human civilization. Only an alliance of civilizations could oppose the United States’ empire: the Russian civilization whose orbit includes the Community of Independent States (CIS); the Chinese, the Indian, the Islamic and the Latin American civilizations. It is an immense space where we could create more equitable markets, our own stable financial system, our collective security mechanisms and our philosophy, giving priority to the intellectual development of man in the face of western modern civilization, which emphasizes material goods, and measures success by the amounts of mansions, yachts and restaurants people have. Our mission is to reorient the world towards justice and intellectual and spiritual growth. I have also reported this on my blog about Fidel Castro aligning himself with the neo-Soviet Shanghai Cooperation Organization and other organs made up of "ex" Soviet Republics. NZ Communists and the Labour Party. Russia To Rule the Mediterranean?